LSU’s basketball season came to a thudding halt Friday night at Capital One Arena in Washington, D.C.
Michigan State, one of the elite college basketball programs in the country, dealt the Tigers a convincing 80-63 setback in the East Regional semifinals. Such a margin of defeat should not be surprising. Ten times, LSU teams have reached at least the regional finals of the NCAA tournament. All but two of the Tigers’ season-ending defeats in those ten years came by double digits. LSU never had the lead against the Spartans and never was in control of the game with the exception of the first few minutes of the second half. The double-digit setback was only the second of the season for the Tigers. Now is not the time to dissect what happened on the floor against Michigan State. 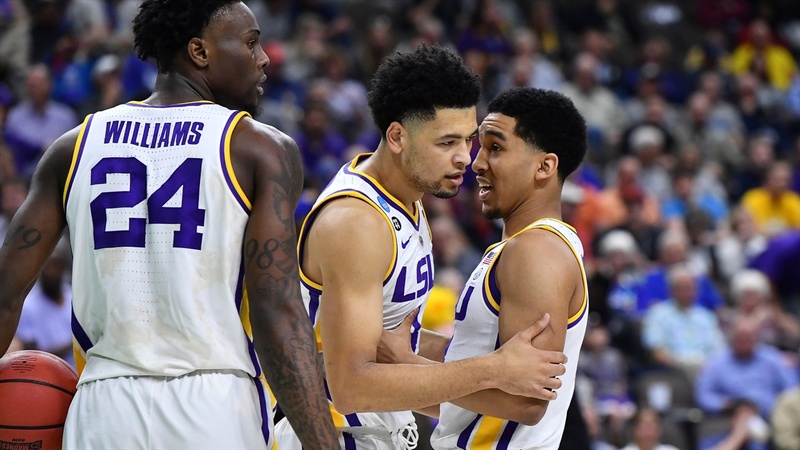 Now is the time to heap some praise on what the LSU players accomplished amidst tragedy and controversy throughout the season. The Tigers won 28 games, captured the outright Southeastern Conference championship and reached at least the regional semifinals. Only one other LSU team reached those three standards. The 1981 team won 31 games, claimed the outright SEC title and reached the national semifinals. The tragedy began hours before the first official practice of the season when junior forward Wayde Sims was shot and killed. Sims was highly respected by his teammates, most of whom had known him for just a few months. A Tigers team, loaded with young players, had to go through the difficult grieving process. Less than one month later, the saga of coach Will Wade’s recruiting tactics began. There were tapes in a federal trial in which Wade appeared to be discussing the recruitment of Balsa Koprivica with Christian Dawkins, the runner for an agent. The judge did not allow the tapes to be entered in the trail which resulted in Dawkins and two other individuals being convicted. Beginning from this time in mid-October, Wade’s name would be connected with possible irregular recruiting tactics throughout the season. In early March, with LSU on the verge of clinching the SEC championship, Wade was heard on another batch of FBI tapes – pertinent to a second basketball corruption trial. Before the tapes were leaked to Yahoo Sports, it had been reported that Wade would be subpoenaed for that second trial. In the second group of tapes, Yahoo Sports reported that Wade was discussing an offer to Dawkins concerning Tigers freshman Javonte Smart. When Wade refused to discuss the content of the tapes with LSU officials, he was indefinitely suspended. Smart was withheld from the regular-season finale against Vanderbilt as university officials investigated to see if he was eligible. Smart was reinstated in time for the Tigers’ SEC tournament game against Florida. But, there was no Wade on the sidelines. Tony Benford was named interim head coach. Through all these distractions, LSU had to prepare for the NCAA tournament – just the school’s third appearance in the Big Dance since 2006. This Tigers squad was not a veteran group. Four of the eight players in the rotation were freshmen – signed by Wade. LSU’s players weathered all the questions from members of the media and all the taunts from opposing fans. The Tigers defeated Yale and Maryland in first and second-round NCAA tournament games by a total of seven points. The players on this team developed a bond which enabled it to block out the noise off the court. That closeness helped LSU in close games. The Tigers played 18 games decided by six points or less. LSU won 13 of those tight contests – including five in overtime. Sophomore point guard Tremont Waters was a coach on the floor, particularly during the absence of Wade. Skylar Mays, the only three-year player in the program, was the ‘glue guy.’ Oregon transfer Kavell Bigby-Williams provided much needed leadership. Finally, the four freshmen – Naz Reid, Smart, Emmitt Williams and Darius Days – never shied away from the big moment. More than anything else, these Tigers players showed maturity well beyond their years in a very difficult environment. Where the LSU basketball program is heading remains a huge question mark. However, there is no denying that the players on the 2018-19 SEC championship should receive a tremendous amount of the credit for the pleasing moments provided to Tigers basketball fans this season.